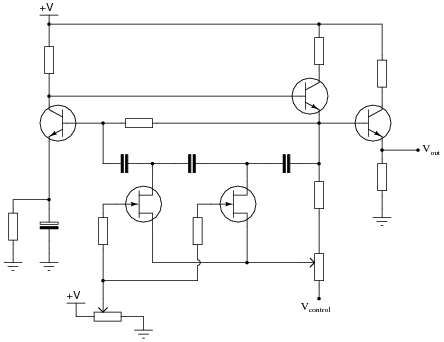 This circuit has been greatly simplified from that of a real, pulse-control power circuit. 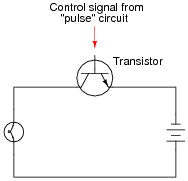 Just the transistor is shown (and not the "pulse" circuit which is needed to command it to turn on and off) for simplicity. All you need to be aware of is the fact that the transistor operates like a simple, single-pole single-throw (SPST) switch, except that it is controlled by an electrical current rather than by a mechanical force, and that it is able to switch on and off millions of times per second without wear or fatigue. When the transistor is on, is acts like a closed switch: passing full load current, but dropping little voltage. Thus, its ÖN" power (P = I E) dissipation is minimal. Conversely, when the transistor is off, it acts like an open switch: passing no current at all. 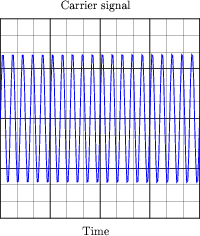 Thus, its ÖFF" power dissipation (P = I E) is zero. The power dissipated by the load (the light bulb) is the time-averaged power dissipated between ÖN" and ÖFF" transistor cycles. Thus, load power is controlled without "wasting" power across the control device. Students may have a hard time grasping how a light bulb may be dimmed by turning it on and off really fast. The key to understanding this concept is to realize that the transistor's switching time must be much faster than the time it takes for the light bulb's filament to fully heat or fully cool. The situation is analogous to throttling the speed of an automobile by rapidly "pumping" the accelerator pedal. If done slowly, the result is a varying car speed. If done rapidly enough, though, the car's mass averages the ÖN"/ÖFF" cycling of the pedal and results in a nearly steady speed. 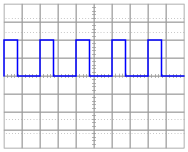 A very important concept in electronics is modulation. 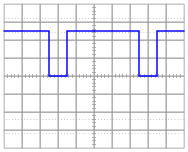 Explain what "modulation" means, and give one or two examples of it. Modulation is the act of impressing information onto an otherwise featureless stream of matter or energy, usually for the sake of communicating that information over a long distance. Radio is a very common example of modulation, but I'll let you research a few more on your own! A primitive form of communication long ago was the use of smoke signals: interrupting the rising stream of smoke from a fire by waving a blanket over it so that specific sequences of smoke "puffs" could be seen some distance away. Explain how this is an example of modulation, albeit in a non-electronic form. It is important for students to understand that modulation is not limited to electronic media. Stranger examples than this may be cited as proof. I once spoke with an engineer specializing in vibration measurement who told me of a very odd application of modulation for data communication. He worked on the design of a vibration sensor that would be embedded in the head of an oil well drill bit. This sensor was supposed to transmit information to the surface, thousands of feet up, but could not use radio or any other "normal" data media because of the distances involved and the harsh environment. The solution taken to this unique problem was to have the sensor activate a valve at the drill head which would modulate the flow of drilling mud up to the surface: a byproduct of the drilling process that had to be pumped up to the surface anyway. 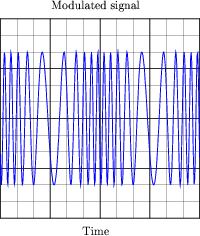 By pulsing the normally steady mud flow, digital data could be communicated to pressure sensors at the surface, and then converted into binary data for a computer to archive and translate. Granted, the bit rate was very slow, but the system worked. An application like this shows how important it is for students to exercise creativity. The really interesting problems in life do not yield to "tried and true" solutions, but can only be overcome through the exercise of creativity and skill. Do everything you can to expose your students to such creative thinking within their discipline(s), and this will help them to become the problem-solvers of tomorrow! I do not expect that students will be able to precisely sketch the modulated waveform, especially when the period of the carrier is so short. However, they should be able to express the general idea of amplitude modulation in some form of drawing or sketch, and that's all I'm interested in seeing from them in response to this question. I do not expect that students will be able to precisely sketch the modulated waveform, especially when the period of the carrier is so short. However, they should be able to express the general idea of frequency modulation in some form of drawing or sketch, and that's all I'm interested in seeing from them in response to this question. 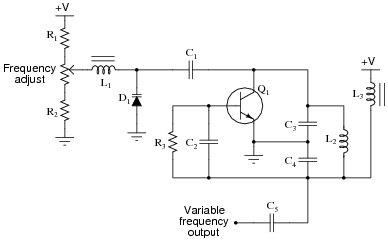 The oscillator is of the "Colpitts" design. 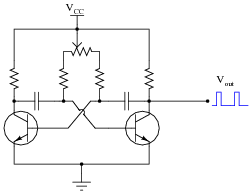 The key to understanding this circuit's operation is knowing how the varactor diode responds to different amounts of DC bias voltage. Explain how this circuit works, especially how the diode exerts control over the oscillation frequency. 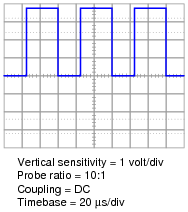 Why does the output frequency vary as the control voltage varies? 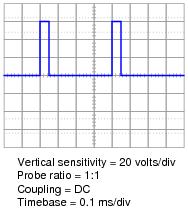 Does the output frequency increase or decrease as the control voltage input receives a more positive voltage? Note: "RFC" is an acronym standing for Radio-Frequency Choke, an iron-core inductor whose purpose it is to block radio frequency current from passing through. 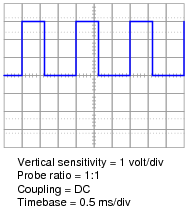 The oscillator is of the RC "phase shift" design. Explain how this circuit works. 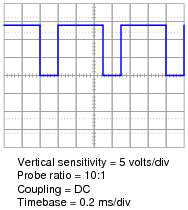 Why does the output frequency vary as the control voltage varies? Does the output frequency increase or decrease as the control voltage input receives a more positive voltage? To understand how the JFETs are functioning in this VCO design, closely examine the ßaturation" regions of a JFET's characteristic curves. 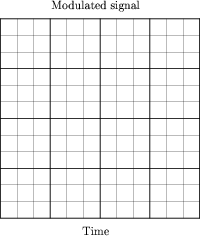 Note that these regions appear as nearly straight-line sections. 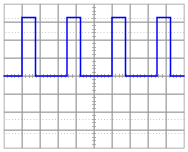 This indicates something about the behavior of a saturated JFET that is exploited in this VCO circuit. Note: the schematic diagram for this circuit was derived from one found on page 997 of John Markus' Guidebook of Electronic Circuits, first edition. Apparently, the design originated from a Motorola publication on using field effect transistors ("Low Frequency Applications of Field-Effect Transistors," AN-511, 1971). 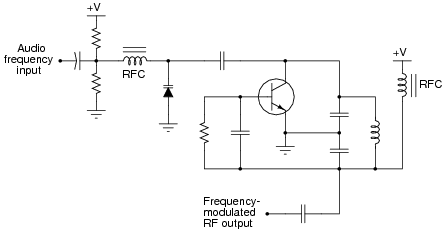 FM tends to be a far more noise-resistant means of signal modulation than AM. For instance, the "crackling" form of radio interference caused by natural lightning or the "buzzing" noise produced by high-voltage power lines are both easy to hear on an AM radio, but absent on an FM radio. Explain why. Radio interference manifests itself as additional peaks on the ënvelope" of a modulated carrier wave. AM reception is based on the extraction of that envelope from the modulated carrier, and so AM receivers will "pick up" unwanted noise. 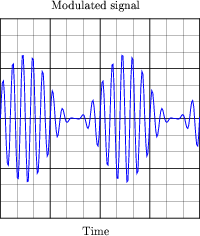 FM reception is based on the extraction of information from changes in frequency, which is largely unaffected by noise. The purpose of this question is to have students relate their understanding of basic RF and antenna theory to a very practical problem of broadcasting low-frequency (in this case, audio) information. A fun exercise to do along with this question is to calculate the necessary physical dimensions of a quarter-wave ([(l)/4]) antenna at a frequency of 2 kHz, keeping in mind that l = v/f and v � 3 ×108 meters per second. 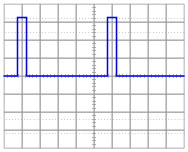 Calculate the duty cycle of this waveform, and also the average power dissipated by the load assuming a load resistance of 1.8 W.
Calculate the duty cycle of this waveform, and also the average power dissipated by the load assuming a load resistance of 10.3 W.
Correlate the duty cycle of the oscillator's output signal with motor power. In other words, describe how increases and decreases in signal duty cycle affect the amount of power delivered to the electric motor. Transistor power dissipation will increase if operating in its "linear" range of operation rather than being completely cut off or saturated. This decreases its service life as well as the energy efficiency of the circuit. Review with your students what it means for a transistor to be in "cutoff" or in ßaturation," if they are not familiar with these terms or if it has been a while since they have studied this. A clear understanding of this concept is crucial to their being able to understand the efficiency of PWM power control. This question probes students' knowledge of frequency spectra and logarithmic scales. 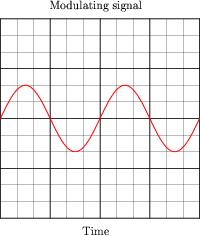 Note that with a pure sine wave, there is but a single peak on the frequency spectrum. Since the circuit in this question embodies a general power control principle, it would be good to contrast it against other forms of power control. Ask your students how they think this method of control compares to that of placing a variable resistance in series with the motor. Is the ßwitching" method more or less efficient? Calculate the duty cycle of this waveform, and also the average power dissipated by the load assuming a load resistance of 2.5 W.
Calculate the duty cycle of this waveform, and also the average power dissipated by the load assuming a load resistance of 40.7 W.